Created in HTML5, this new player sidesteps limitations of the old Flash player and makes room for further growth in the future. So aside from the sleek new design, what exactly does the new player offer? 1. More mobile accessibility. HTML5 cooperates far better with mobile devices than Flash does. Is a mobile app not yet available for your tablet or phone? For most users, this new player will work through your main mobile internet connection—no app needed! Simply log in and access music on your mobile internet browser just as you would on your computer. 2. More track information. 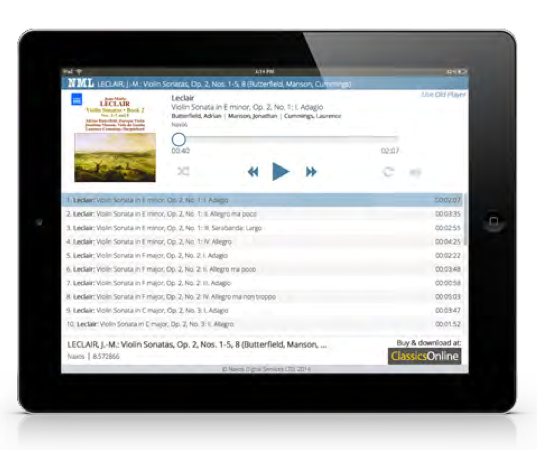 The HTML5 player displays more information for each track, allowing you to find just the one you need. This is especially helpful when streaming, say, a disc or playlist full of Vivaldi works where half the tracks are simply titled “Allegro.” Now track lists in the player will include the rest of the work title so you can quickly identify which of those Allegros is THE Allegro. 3. More flexibility in player size. Previously, the player stayed the same size no matter how you expanded the window. Now, the player design adjusts to better fit the size of the window. The dirty details: Our new HTML5 player is supported in the following browser versions. If you're not seeing the new player, it's likely you're running an older version of your browser. A quick update should allow you to enjoy NML's new experience right away! It seems like while using thew new HTML5 player on Chrome 32.0 on Mac OS X 10.8, I can not change the playback position within the track until it has played all the way through fully once. This is a hinderance for use in studying a track. Is this a bug or a "feature"? Thanks. Other than that, the new player looks great! Hi! Thanks for the feedback. It certainly shouldn't be doing that. If you could email us at NMLHelp @ NaxosUSA . com, we'd be glad to look into what's happening. And if you could, include the full string of numbers for your Chrome version. Thanks! Tried this on my Windows RT device and Windows Phone - works like a charm on both. Well done! The vocal parts are really distorted and slow with the Firefox 32.0.3. We tested this on several Windows 7 Professional PCs. We'll be happy to look into this. Email us at NMLHelp @ NaxosUSA . com, and let us know what institution you are with, whether you are accessing on campus or via proxy, and what specific album you are referring to (or a couple specific examples, if multiple). Thanks! For several years, because Apple would not support flash, I was forced to listen through my bulky computer with poor quality audio. Now I can use my iphone and connect it to my stereo system while working on my computer from another room. This is amazing!